Hoke v. Henderson, a case decided by the North Carolina Supreme Court in 1834 in an opinion by Chief Justice Thomas Ruffin, held that state offices were a form of property, and that officeholders were therefore protected by the state constitution against arbitrary removal by the legislature. Although the legal argument was eventually rejected by the courts of every other state and by the federal courts, Hoke remained the law in North Carolina throughout the nineteenth century, being often reaffirmed. In the late 1890s, as political power shifted from the Democrats to the "Fusion" of Republicans and Populists, then back to the Democrats, Hoke was invoked to protect officeholders against ouster. Reliance on that precedent by two justices of the state supreme court became, in fact, one of the grounds for their impeachment in 1901. Although finally overruled in 1903, Hoke remains a classic statement of judicial independence. Walter F. Pratt Jr., "The Struggle for Judicial Independence in Antebellum North Carolina: The Story of Two Judges," Law and History Review 4 (1986). Ruffin, Thomas. "Opinion in Hoke v. Henderson." The Papers of Thomas Ruffin Volume 4. Raleigh, N.C.: Edwards and Broughton. 1920. p. 269. http://digital.ncdcr.gov/u?/p249901coll22,332994 (accessed August 28, 2012). "Speech of A. W. Haywood, Esq., of Counsel for the defense, in the trial of Dr. Eugene Grissom: Superintendent, North Carolina Insane Asylum, July 17, 1890; being the third speech delivered for the defense, the speech of Hon. Thomas C. Fuller being the first and that of Mr. T. P. Devereux being the second." Raleigh, N.C.: Edwards & Broughton. 1889. p.4. http://digital.ncdcr.gov/u?/p249901coll22,262775 (accessed August 28, 2012). "Document 27: Answer of Respondents in Impeachment Proceedings." Public documents of the State of North Carolina Volume 2. Raleigh, N.C.: Edwards & Broughton. 1901. http://digital.ncdcr.gov/u?/p249901coll22,129805 (accessed August 28, 2012). Watson's Photographic & Fine Art Gallery. "Photograph, Accession #: H.19XX.336.4." 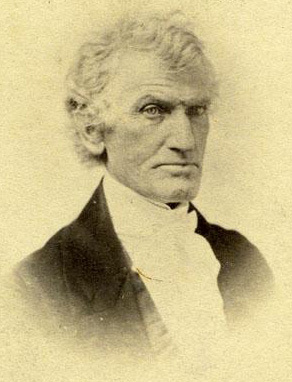 (photograph of Thomas Ruffin, circa 1860-1870). From the North Carolina Museum of History.